PEOPLE have been describing Nerial's Reigns series as "Game of Thrones meets Tinder" for so long it's only natural the developer has finally teamed up with HBO to make exactly that game. 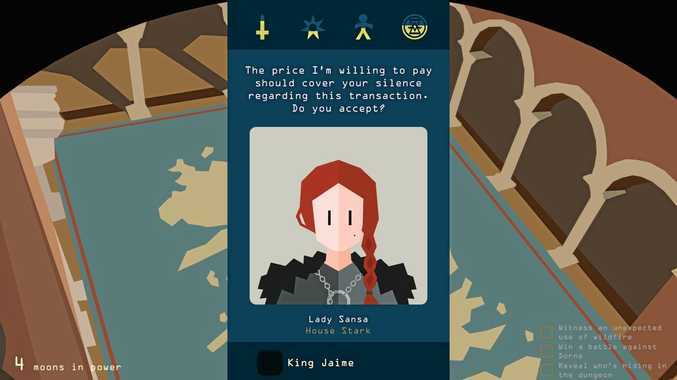 The theory behind the Reigns games - available on Androd, iOS and Steam - are simple; you're the ruler of a medieval country and people will come to you with problems or situations requiring an action, presented via cards, swipe left for one answer, swipe right for the other. The games are well known for their quirky sense of humour and the fact you will die a lot, in a variety of creative ways. It's a natural fit for the Game of Thrones series and unsurprisingly, the latest instalment is a lot of fun as a result. While earlier games operated on a succession basis - each time you died, your successor took over the throne - this game's framing device is that Melisandre the Red Witch is using the game cards to divine the future and work out who should ultimately sit on the Iron Throne - and if you die, the cards are reshuffled and you can try again with the same ruler or a different one who may have been unlocked during the course of your reign. You start off as Daenarys "The Dragon Queen" Targaryn and more characters from the show unlock as you progress, including Tyrion Lannister and Jon Snow. Nerial deserve credit for not just treating the Game of Thrones connection as a gimmick, but actually building on the other games in the series to create something engaging and worth playing in its own right. For something that's essential yes/no choices, the game is surprisingly involved, with plenty of intrigue, shifting plot developments and surprises. Your choices have consequences in four areas - strength, piety, popularity and wealth. Maxing (or totally depleting) any of the meters results in your gruesome death, be it by an angry mob, getting thrown into a burning vat, betrayed by your guards, poisoned by a lover... like the TV show, there's a lot of ways to die horribly, so keeping everything in check (and yourself on the Iron Throne) is a delicate balancing act to say the least. Ideally you'd be a Game of Thrones fan to get the most out of it - who some of the characters are and what motivates them will be a lot clearer - but it's still playable even if you're not fully versed in the intricacies of Westeros politics, and well worth checking out if you're looking for something fun to play on your mobile device.